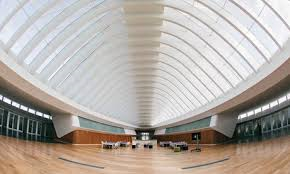 Florida Polytechnic University’s new library is not the first of its kind, although the completely digital libraries, that is physical buildings where people can access ebooks only, are still very unusual even in America. 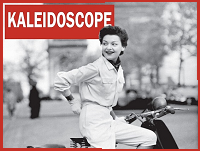 It is a new way of thinking a library, that tries to meet with the tendencies of the digital age and the growing amount of digital cultural resources. the new library at Florida Polytechnic University: a bright, open space with computer terminals, desks, and comfortable spots to read. Being a Polytechnic University, the idea behind the choice of creating a digital-only univesity library is to encourage and prepare students to read, search and manage digital documents, in order to increase their digital literacy and their abilities in digital research. These are certainly useful skills that are fundamental in the industry, where the students would be placed in their future jobs. There are other advantages in having only ebooks. The archive of this library consists of about 135,000 ebooks, and funds are available for acquiring, on demand, new e-texts that are not present yet in the library; in a physical library with shelves and pyles of volumes, to have such a richness and amount of books would not be possible – and next to that, search and retrieval of information would be certainly more difficult than within the digital library. It is also easier that students and readers find new books and information of interest by chance, while surfing the digital archives. Although a very advanced idea, still it looks strange to completely lose the experience of walking through rooms fully covered with books, as we normally used to do when we were students. Indeed the digital era and the opportunities offered by the digitized cultural heritage have a very strong impact on our society and our habits of accessing information and culture. 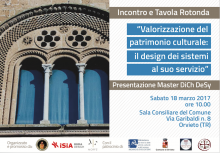 Public round table which will take place on Saturday 18 March 2017 at 10:00 am, hosted by the Municipality of Orvieto (Sala Consiliare), to present the I level academic master in Digital Cultural Heritage Design System, which aims to provide participants with technical, operational and managerial knowledge for the management of istitutions, heritage and events in the filed of arts and culture, both material and immaterial.